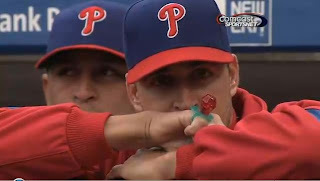 Because relief pitcher Jack Taschner was not on the Phillies 2008 team, he felt left out as the rest of the Phillies recieved their World Series rings. So, he brought his own ring. Each ring is 14 karats and has 103 diamonds, one representing each win, including the postseason. On the side features the players name atop the Liberty Bell, and on the other side its the World Series trophy on Citizen's Bank Park representing fan support.